WARNEMUNDE and ROSTOCK, GERMANY: Warnemunde is an old sleepy fishing village to enjoy the sun, the beach, and the unique maritime world of experience. It was part of East Germany before and was developed to a major harbor town. Many seaside resorts raised up here by the scenic Warnow River. Rostock is a beautiful Hanseatic City with its own seaside resort…probably one of the oldest seaside resorts in Germany. There are plenty to see and do here. Visitors can witness German Gothic brick architecture, a city wall, gates, gabled houses in its old town. We did this short day trip with a guided tour in a small group. We book through a company called “SPB Tours” for this tour along with our St. Petersburg (Russia) and Tallinn (Estonia) tour. I can’t tell the exact amount they charged us for specifically this tour. But the whole package of visiting 3 cities costs us around 1100 USD. Our guide, Jans, was a very friendly and knowledgeable person who is always ready to answer your questions and explain you everything in very details. The package included all the transportations and lunch. We didn’t have to pay any tickets/entry fees to any of the sites in Warnemunde/Rostock visit. 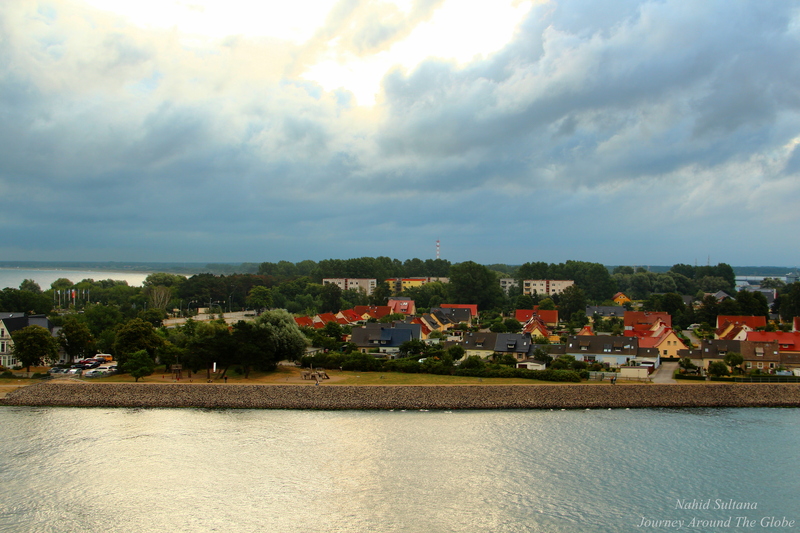 TIME of TRAVEL: We took a cruise from Dover, England on Baltic Sea in August, 2013 for 12 days. Our first stop was Copenhagen, Denmark. But since we’ve been to Copenhagen before we stayed back in the ship to enjoy the amenities that our ship, Carnival Legend, had to offer. Kids were happy that the swimming pool and hot tub were empty and they didn’t have to share it with others ;). And I was happy that I didn’t have to stand in the big line to get my Chinese from lunch buffet. Our ship left Copenhagen around 5pm. We were standing on the 10th floor (Sundeck) of the ship and saw our big vessel moving over the blue water and leaving Copenhagen port behind us. Next morning we reached Warnemunde, Germany kind of early in the morning. I did get up very early, around 6am, to see the villages/cities before reaching the port. Thanks to my husband for booking a room with extended balcony…I could enjoy the early morning light in my PJs with messy hair without worrying people looking at me. We reached Warnemünde around 6:30am and we had to meet up with our tour guide at 8:45am. So, woke the kids up, got ready, had quick breakfast, and got out of the ship by 8:15…perfect planning. It was a bit cloudy in the morning but later it turned out to be a gorgeous one…loved the energetic weather in both of the villages. EATING and SHOPPING: Both Warnemunde and Rostock are flooded with loads of bars, cafes, restaurants in the city center, near the promenade and harbor. We had lunch in Rostock near where all the ferries dock from various places. There was a Polish festival going on near the promenade and we had some pizzas and drinks. We didn’t see too many souvenir shops that were open in these two towns, may be because it was a Sunday. One or two that we saw open were mainly selling maritime items along with generic t-shirts, key-rings, and postcards. The best and biggest souvenir shop we saw was near the port where our Carnival Legend was docked (think the name was Pier 7). We ended up going there on our way back to ship in the later afternoon and bought a big ceramic lighthouse for only 8 euros…very reasonable price. They had plenty of local food items, lots of home décors, and many collective items for very cheap prices…the store was heavily crowded by the time we were ready to head back to the ship. PLACE WE’VE VISITED: We spend most of our time in Rostock and may be an hour in Warnemunde. We were done and back to the port at 2:30pm. 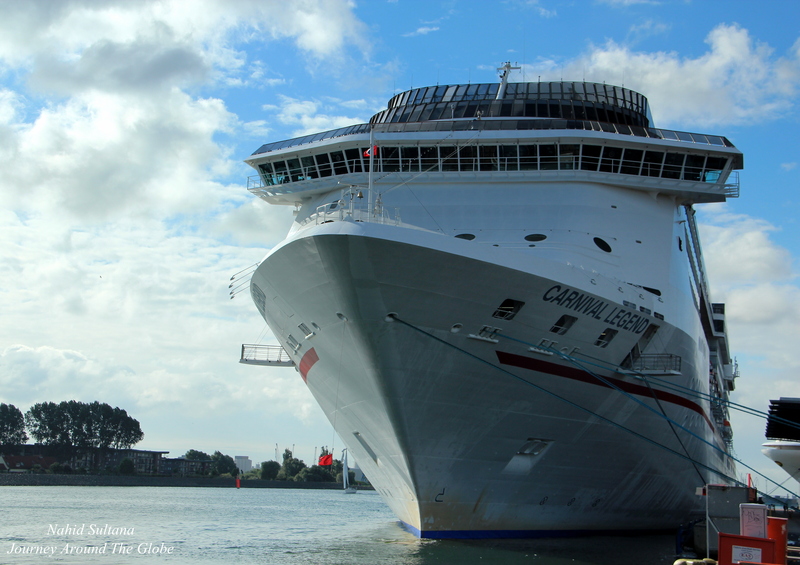 Around 4pm our big ship started sailing again…towards Helsinki, Finland. 1) WARNEMUNDE WALKING TOUR: This is a scenic harbor town before Rostock’s harbor entry. The city is by the fresh water of River Warnow that meets the salty mass of the Baltic near Rostock district. Beach Promenade of Warnemunde was built about 100 years ago parallel to the beach. Time has stood still here. Sleek yachts, screeching seagulls, men in wooly hats catching out of the nets, Viking style sail-boats anchored on the water are just some daily pictures here. Long line of sailors’ and fishermen’s narrow gabled houses stand along the old tree-lined waterway. The pulsating promenade is packed with pubs, ice-cream parlors, café, and shops. We saw the 19th century lighthouse from distance but that beach area is where most of the overnight tourists stay and enjoy Warnemunde. Only few minutes of walk from Warnow, narrow streets that our guide took us through were haven of tranquility. Back alleys are very attractive too with their crooked little streets and bumpy cobblestones. 200 years old houses dwell here in small picture perfect neighborhoods. Another canal (may be a part of Warnow) runs in the old town making a home of lots of private yachts and fishing boats. They make popular subjects for photos in Warnemunde. After we were done with the walking tour, we took a 45 minutes boat ride to Rostock, Meckelberg. This is not the only way to get to Rostock. There is a train that connects these two cities also, which we took on our way back to Warnemunde at the end of the day. 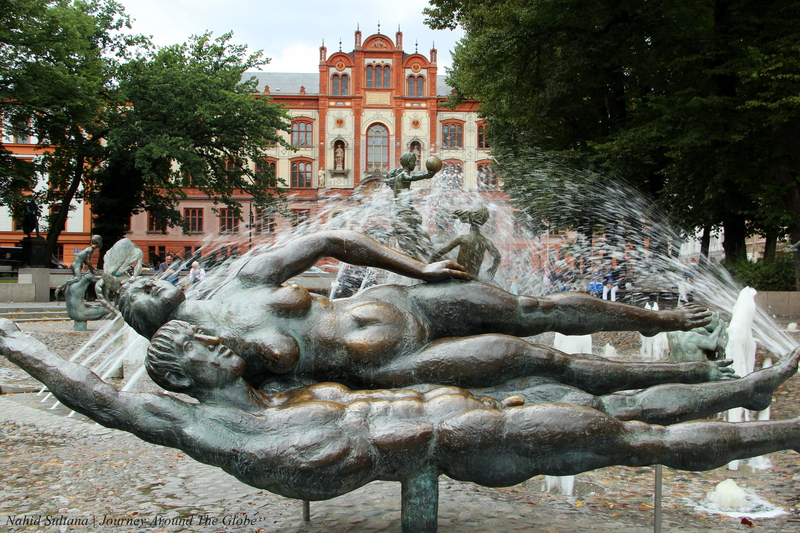 All the fees for transportation were covered with our tour package including lunch in Rostock. 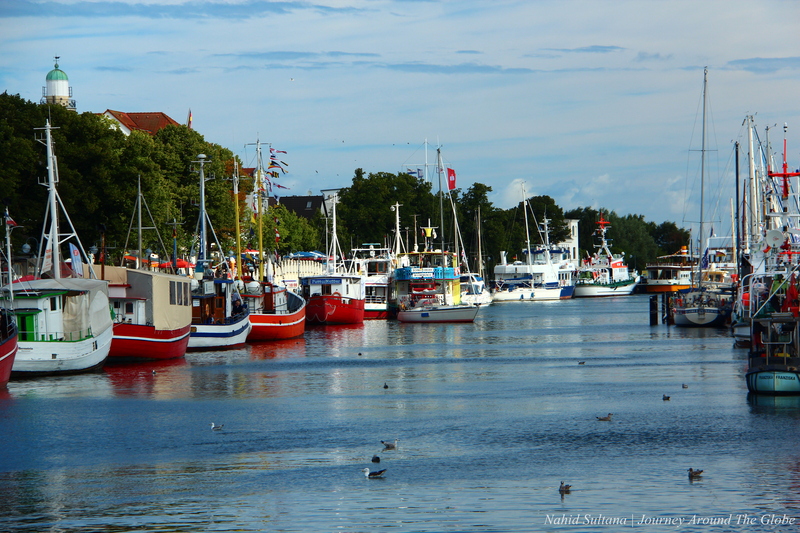 2) ROSTOCK: Rostock is another tranquil fishing village by the Baltic Sea, little bigger than Warnemunde. It was heavily bombed during WWII destroying 40% of the city. Later the city became a major port for East Germany. Currently, it has some picturesque seaside resorts, superb beaches, and several shipyards. The town is pumped with lots of tourist business amenities, especially in summer, for its cultural diversity, historical treasures, fresh fish, bustling promenade, and elegant shopping streets. You can encounter the glorious history of this once so prosperous city in every corner. Thanks to Rostock’s prestigious university and its intellectual climate, from early on scientists and students were already researching every sect of science and technology field. The first jet aero-planes took off in Rostock. The most modern ships of every era have been launched here. Today, the largest diesel engines and best wind generators in Europe are built in the city. a) CITY HARBOR: This kilometer-long promenade is a popular destination by the Baltic Sea with large warehouses, dozens of bars and restaurants, several shops. This is where we docked with our ferry from Warnemunde. It’s an ideal place to relax or party…depending on the mood. There was a big Polish event going on during our visit. 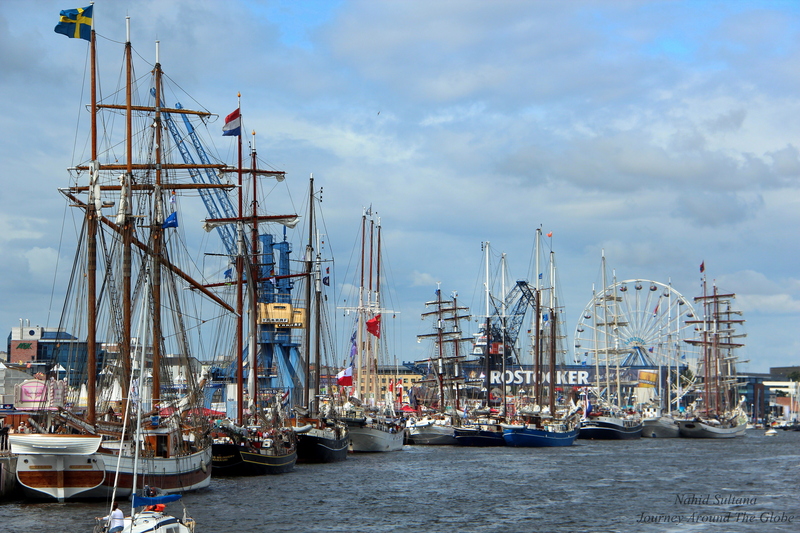 One of the biggest festivals of the town that we experience here was the Hanse Sail. 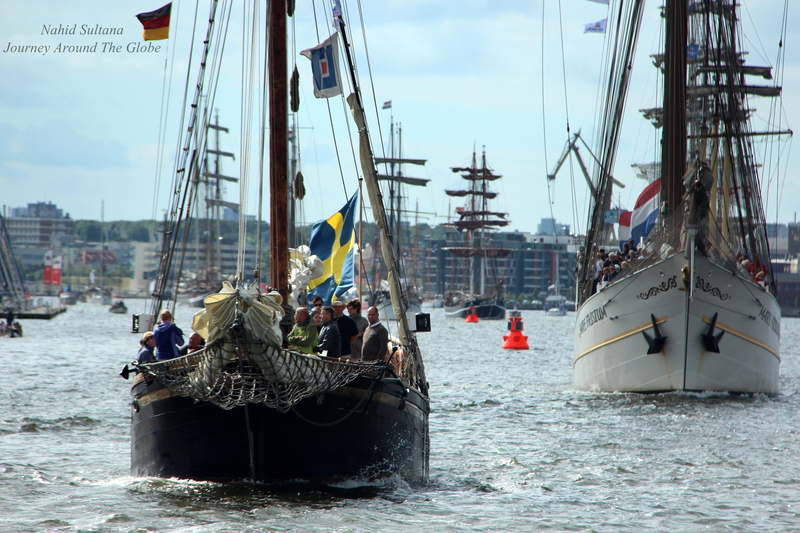 The traditional ship rendezvous is amongst the largest in the world. It takes place in August of ever year for four days. The procession is joined by around 250 of fully rigged sailing ships from the four corners of the earth making it the biggest of its kind and offers thousands of onlookers an enchanting spectacle. Old saloon steamers, icebreakers, and Zeesen boats take their places in this magnificent parade. b) ST. MARY’S CHURCH: This is one of the largest parish churches in North Germany and the most significant church of Rostock. Tall spire of it dominates the city and view of its harbor. You can’t miss its colossal size and bold structure with 5-6 million bricks near the Neuer Markt. An early Gothic church from 1230 AD was replaced in 15th by the present basilica with nave and two aisles, ambulatory, radiating chapels and transept. 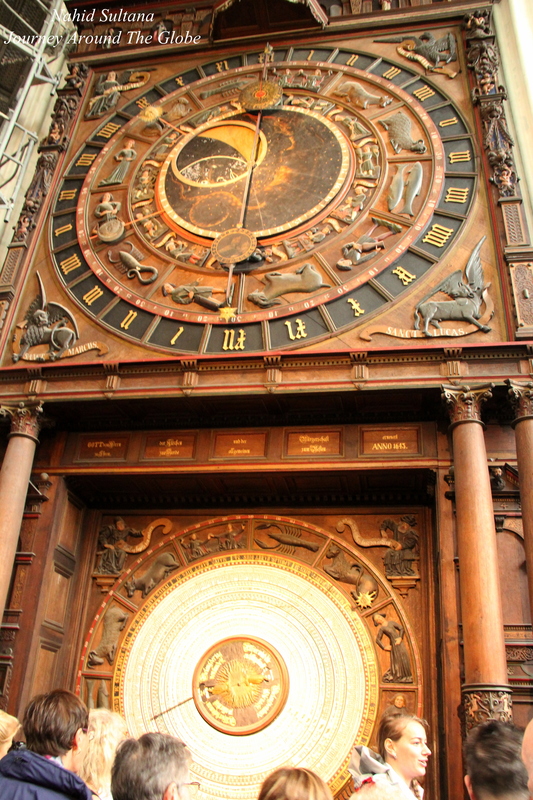 The beautiful interior includes a massive and intriguing choir that is as big as a 3-story building, bronze font of 1290 AD – unique in Baltic region, stained glass windows, and an astronomical clock from 1472. This old clock still ticks perfectly correctly – the only one in the world from that epoch to do so. Everyday exactly at noon many visitors gather around this historic clock to see the Jesus greeting his apostles with procession and carillon. It was free to enter the church. Try to visit it around noon to see the astronomical show. It’s located only 10 minutes of walk from the harbor and next to the Town Hall square. c) NEUER MARKT and TOWN HALL: This is a big gathering point of the city. Salmon colored Baroque style town hall with seven spires stands opposite of few old buildings with stepped gables by the row in a large square. The original building behind the present town hall façade is 800 years old from the 13th century. Some of the richly decorated buildings in this square include registry office and city library. Even some simple warehouses and general buildings got extravagant brick façades. d) UNIVERSITY SQUARE: University Square is the main square and one of the liveliest places of the city. Rostock boasts for housing Northern Europe’s oldest university from 1419. Rostock University’s main building from 1867 can be seen from the square here. Enjoy the line of old vibrant buildings, many shopping and eating places, and “Fountain of Joy” in front of the university’s main building. e) LANGE STRASSE: From the 1950s, this whole street came into being with departmental stores, high-rise buildings. This was created in the style of the brick age and gradually became the fashion district of Rostock.